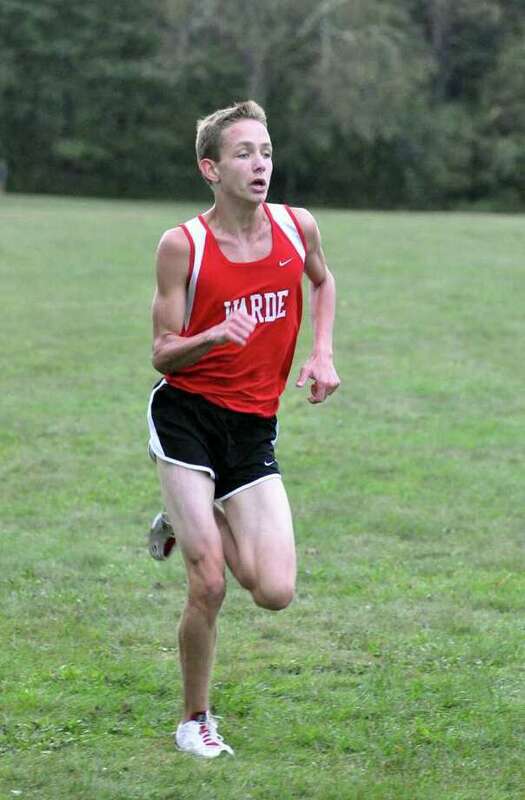 Fairfield Warde's Harry Warner competes in the boys cross country meet at Waveny Park in New Canaan on Tuesday, Oct. 5, 2010. The Staples girls cross country team swept a multi-team meet at Waveny Park in New Canaan on Tuesday. Staples raised its record to 10-3 and was perfect against New Canaan, Brien McMahon and Harding with 15-50 victories over all three squads and defeated Fairfield Ludlowe, 22-37. Lady Wreckers senior captain Emily Hanrahan said, "I am very pleased with the outcome. We all had good races and it showed in the score." From the poor weather conditions to teams showing up late, Staples faced many challenges during the meet. Hanrahan said, "The mixups with traffic forced us to be very flexible with our strategy. It changed multiple times in the half hour leading up to the race but when it came down to it we were just trying to work together and all race hard." Senior Ingrid Johnson finished first for the Lady Wreckers and second overall with a time of 16:09. Following her were Hanrahan (fourth place, 16:44) and juniors Caroline Smith (fifth place, 16:57), and Alex Popkin (sixth place, 17:02). Hanrahan said. "Alex Popkin had one of her best races this week and her dedication in practice has begun to really pay off in meets." Next for Staples were sophomore Judy Feng (seventh place, 17:10), junior Courtney Mullen (eighth place, 17:33) and senior captain Rachel Myers (ninth place, 17:35). The Lady Wreckers will compete tomorrow in the Wickham Park invitational. Hanrahan said "it is the biggest meet of the season and that it will be a difficult course."